The 2008 tournament was held on December 5 & 6. The four participating teams were: Notre Dame of East Stroudsburg, Pius X of Roseto, Palisades and of course the Crusaders of Notre Dame of Green Pond. This year's tip off classic was won by the host team. The 2009 tournament was held on December 11 & 12. The four participating teams were: Notre Dame of Utica, New York, Pius X of Roseto, Palisades and of course the host Crusaders of Notre Dame of Green Pond. The 2010 tournament was held on December 10 & 11. The four participating teams were: Moravian Academy, Pius X of Roseto, Palisades and of course the host Crusaders of Notre Dame of Green Pond. The 2011 tournament was held on December 9 & 10. The four participating teams were: Quakertown, Pius X of Roseto, Palisades and of course the host Crusaders of Notre Dame of Green Pond. The 2012 tournament was held on December 7 & 8. The four participating teams were: Quakertown, Pius X of Roseto, Palisades and of course the host Crusaders of Notre Dame of Green Pond. The 2013 tournament was held on December 7 & 8. The four participating teams were: Notre Dame of Utica NY, Pius X of Roseto, Malvern Prep and of course the host Crusaders of Notre Dame of Green Pond. The 2014 tournament was held on December 5 & 6. The four participating teams were: Mid Valley, Pius X of Roseto, Lehigh Valley Christian and of course the host Crusaders of Notre Dame of Green Pond. The 2015 tournament was held on December 4th & 5th. The four participating teams this year were: Ben Franklin, Palisades, Freedom, and of course the host Crusaders of Notre Dame of Green Pond. The 2016 tournament was held on December 9th & 10th. The four participating teams this year were: Palisades, Freedom, Allentown Central Catholic and of course the host Crusaders of Notre Dame of Green Pond. The 2017 tournament was held on December 8th & 9th. The four participating teams this year were: Palisades, Freedom, Parkland and of course the host Crusaders of Notre Dame of Green Pond. is hosted by Notre Dame High School in Bethlehem Township, PA. This basketball tournament will be held annually to start the basketball season. This event will help salute Jeff and all the contributions he made to the high school basketball scene throughout the Lehigh Valley, in particular for all the memories he created as a player during his 4 years at ND. 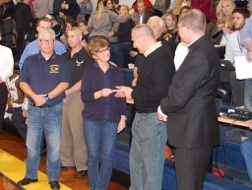 At the 2017 Tip-Off Tournament, Bobby and Jane Dailey presented a check from the Jeff Dailey Memorial Foundation in the amount of $8000 to Notre Dame High School for the 2017-18 school year. The 2018 tournament was held on December 7th & 8th. The four participating teams this year were: Dieruff, Freedom, Parkland and of course the host Crusaders of Notre Dame of Green Pond. 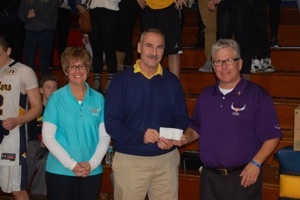 At the 2018 Tip-Off Tournament, Bobby and Jane Dailey presented a check from the Jeff Dailey Memorial Foundation in the amount of $8000 to Notre Dame High School for the 2017-18 school year.